Texas Truxx Outfitters came to DCi in search of a one stop solution to their website needs. Since 1998 Texas Truxx has been dedicated to being the premier supplier of automotive aftermarket parts & accessories in their area, with a specialty in vehicle wraps. After establishing themselves on these fronts they realized that in order to expand even further, they would need a powerful online presence with the capability to not only increase exposure, but foot traffic at their automotive parts & accessories retail location. Luckily, eStore Local powered by DCi and Catalog Rack has tools like a fully functional year make model lookup feature that comes standard and allows visitors to browse their complete inventory quickly and with ease. 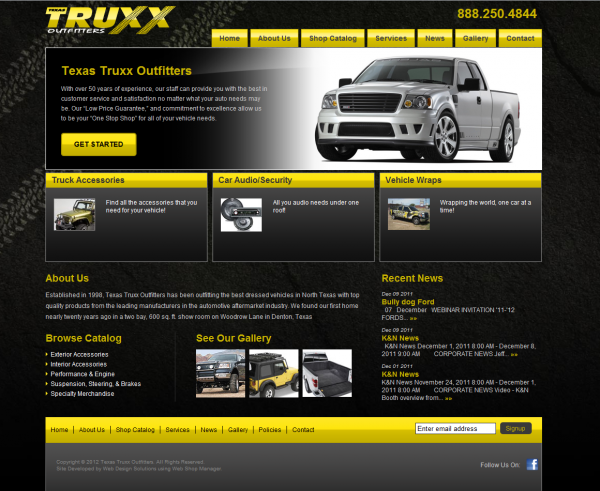 With the help of features such as this, Texas Truxx was on their way to gaining exposure and driving foot traffic to their automotive parts shop.